The art of spinning is growing in popularity as knitters, new and experienced, want to make their own yarn. All it takes is some fluff, a spindle or wheel, and a little practice! 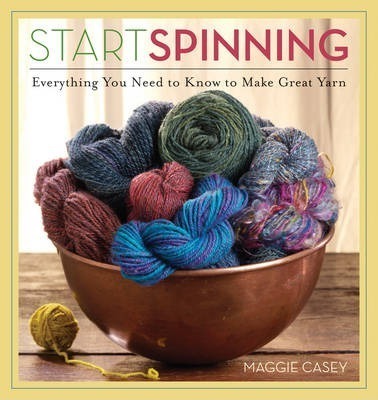 Maggie Casey, co-owner of Shuttles, Spindles, and Skeins yarn shop in Boulder, Colorado, and veteran spinning teacher, takes complete novices to competent spinners in Start Spinning: Everything You Need to Know to Make Great Yarn. Based on Maggie's time-tested Spinning 101 workshop, which she has taught for twenty-two years, readers will learn to spin the yarn of their dreams beginning with an introduction to the various types of fibers available, choosing and preparing (or buying) fiber with which to spin, and detailed instructions for both spinning on a spindle and spinning on a wheel, with extra detail on Wheel 101 complete with plenty of photos. Maggie also offers a special section on troubleshooting and wheel maintenance, plus tips and tricks for creating better yarns. Then she moves into plying, setting twist, using a niddy noddy, and woolen and worsted spinning. Maggie concludes with a chapter on uses for spun yarn, which covers wraps per inch, measuring yards for projects, and size of yarn. Start Spinning: Everything You Need to Know to Make Great Yarn covers all the basics newbies need to spin their own fabulous yarn. Using yarn handspun to your own specifications is like tasting a delicious strawberry from your own garden; once spinners get comfortable creating new and wonderful yarns, anything is possible! Maggie Casey is a co-owner of Shuttles, Spindles, and Skeins, in Boulder, Colorado, where she teaches Beginning Spinning on a Wheel, Drop Spindle Spinning, and Spinning 2, among other subjects. Besides teaching at her shop, Maggie has taught at guilds and wool festivals in the western United States. She has been a skein judge at the Taos Wool Festival and Estes Park Wool Market and was the juror for Roving the Range at Convergence 2004. Her articles have appeared in Spin-Off and been reprinted in Knitters Review. She has been addicted to spinning for thirty years. She holds Part I of the Handweavers Guild of America's Certificate of Excellence in Handspinning and has taught at the Spin-Off Autumn Retreat (SOAR) for the past six years. There have been rare but confirmed sightings of T-shirts reading, "Maggie taught me to spin." She lives and spins in Boulder, Colorado.